Development on my upcoming game continued this past week. When the demo is done by the end of this week I’ll be able to tell you more about just what the hell I’ve been making. On monday and tuesday I worked on the first two scenes of the game, writing the dialogue and setting everything up just right. Apart from a few minor things I was very happy with the outcome. 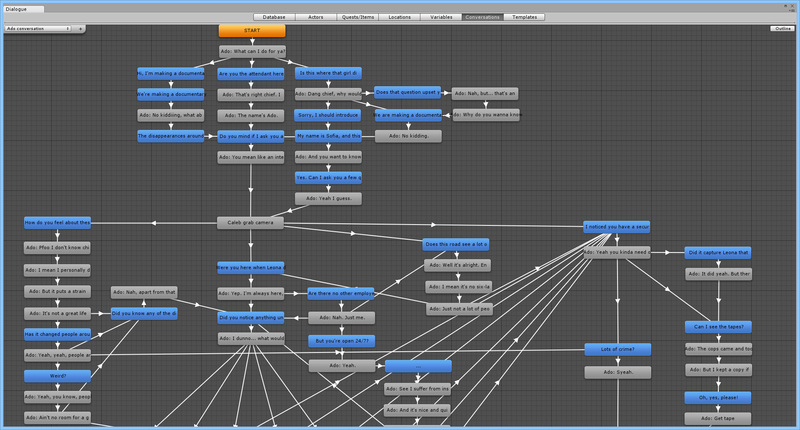 The workflow I had established worked well and allowed for a pretty quick setup of a scene. I also iterated on the story and made it readable to people who knew nothing about the project in preparation for the pitch document I’ll be writing this week. On wednesday I set up the next big scene in the game, which went very smoothly. Because I had finished well on time I set aside work that night to play Kentucky Route Zero Act III. Apart from being impressed as always by the visuals and the tone of the narrative, it reminded me that it is okay to write a little more than bare minimum if it is interesting to read through. On thursday I applied this newfound insight to finishing the last of the in-game conversations, and it was a doozy. I’m very thankful for Dialogue System For Unity, a plugin that made the management of these long branching conversations a lot easier. And most importantly, it integrated with Adventure Creator, which made it top choice over things like Dialoguer or Playmaker. I spent the rest of the day customizing the UI and wiring up things like the fast-travel map and the clue system. On friday I took a break from development to work on a freelance assignment. I was faced with the challenge of drawing a character in vector, but I’m not good enough with vector tools that I could pull that off in two hours and have it look good too. So I decided to give Mischief another try. I sang its praises before but man it really came through for me this time. I could draw exactly like I would in Photoshop (without all the fancy tricks like clipping masks and blending modes though, so back to basics, time to be a real artist again ha! ), but it took the form of infinitely scaleable vectors, ending up with the best of both worlds. I went to buy it right after. Saturday night I tinkered with the game’s code a bit and fixed a bunch of bugs. As it usually goes, I was ready to make a new build and then suddenly all kinds of things came to light. But I managed to fix a good few eyesores. On sunday I mostly worked on missing art and more bugfixes.